Along with tank tops, ice cream, and plenty of vitamin D, flip-flops may just be one of the most significant benefits of warm weather. But choosing the right pair is not always as simple as it might seem. In this article, we will break down the different types of women's flip-flops as well as discuss which are best-suited for various activities. Additionally, we'll go over the different materials used to manufacture these open-toed shoes and how those materials affect both comfort and support. Finally, we'll touch on how to fit your next pair properly. For a full discussion of each of the products, we mention in this article, be sure to check out The Best Flip-Flop Sandals for Women Review. This review includes side-by-side comparisons of 14 different women's flip-flops, and it explains the metrics we used to rate each piece: comfort, stability and support, durability, water resistance, traction, and style. These categories will help shed light on aspects that may be crucial in your quest to finding the perfect pair. The light foam footbeds found on cheap, bargain sandals are the least supportive and stable option. For many, these sandals are often either desperation or impulse buys (i.e., OMG, how did I make it to the beach without a pair of flip-flops!? …or… OMG, bumblebees on this $3 pair of flips!? So cute, must have!!). As a general rule, we don't recommend this style of the footbed. Yes, they're cheap, but they can foster foot problems you want to steer clear of, such as plantar fasciitis. They might be fine as a locker room shower shoe, but beyond that, they are not ideal. While we tested a few models with foam or partial-foam footbeds, those models more accurately fit into the next category, foot-molding footbeds. We also feel it's important to take a minute here and break down the price-value side of things. Super cheap flips wear down and blow out reasonably quickly, so if you're an avid wearer, you could quickly go through more than one pair per summer. Very quickly you will have spent as much or more as one good pair would have cost you. We feel that it's better to do your research and make a substantial investment than continually having to re-buy something cheap and flimsy. Also remember that by buying one nice pair of flips instead of a cheaper "disposable" model, you're putting less trash into the environment. Anyone who has ever walked a trash-ridden beach has probably seen multiple pairs of bright colored plastic flip-flops that washed ashore. Now that we've established why we don't recommend models with light foam footbeds let's move up the ladder to foot-molding footbeds. In our review, we tested several products with foot-molding footbeds, most notably our Best Stylish Buy on a Tight Budget, the Teva Olowahu, our Best Buy for Sporty Adventures, the Base Camp Lite, and the classic Rainbow Single Layer Premier. Sandals like these have footbeds with EVA or foam/rubber compounds that remember the shape of your foot over time. Many people find this type of footbed to be insanely comfortable. When new, your foot sinks in just a little bit, and as you break them in, the footbed becomes an exact mold of your foot. Unlike the light foam footbeds mentioned above, EVA footbeds provide some shock absorption and support. The most significant benefit of these foot-molding models is that they tend to be relatively affordable while still providing some of the perks of high-end contoured footbeds. In general, however, this type of footbed does not offer stellar support or stability. In fact, some experts believe that a foot-molding footbed can exacerbate existing foot anomalies which can then lead to bone and joint problems. If your foot is doing something funny like pronation or supination, these footbeds will mold that issue into the footbed and offer nothing in the way of positive correction. Point being, these are not the sandals that you want to wear on long hikes or all-day excursions, mainly if you have some sort of oddity with your feet. Yes, foot-molding flips are comfortable and more affordable than contoured models, but they're only ideal for general non-excessive use. That said, they are a huge step up from their arch-abusing light foam cousins. If you don't want to shell out for a high-end flip, at least do yourself a favor and opt for a slightly more expensive and infinitely more comfortable foot-molding model. The lightweight EVA-foam footbed of the Olowahu is thick and plush and will mold to your feet over time, but it's not particularly durable or supportive. We only tested one flip that properly fits into this category, the Sanuk Yoga Chakra, which has a footbed made out of real yoga mats. After wearing this model around for several months, we realized that novelty footbeds like this one are more about initial comfort than about overall performance. When the wearer slips them on, they do have that "ahhhh" effect that defined our comfort metric, but they often lack other important qualities like support, traction, or water resistance. And while novelty footbeds are admittedly kind of cool and can be quite comfortable, they also require the wearer to choose what qualities are most important because they rarely give you the full package. Before purchasing one of these flips, be sure to ask yourself how you hope to use them. If it's just a morning at the coffee shop or something to slip on after a workout, then it's probably okay. But if you plan to do more walking in your flips (even during around-town errands), be sure to look for something that provides a little more support and stability. Comfortable? Yes. Supportive or stable? I mean... the footbed is made out of yoga mats, how substantial can it really be? If there's one thing you take away from this section, it should be the understanding that contoured footbeds mean more support and stability which equates to happier, healthier feet (even while on all-day adventures). In this review, all of our top performers had contoured or molded rubber footbeds: the Editors' Choice Birkenstock Gizeh, our Top Pick for Stylish Adventures, the OluKai Lala, the Astral Rosa, our Top Pick for Hiking and Scrambling, the Vionic Tide II, our third place finisher, and the OluKai Ohana, our previous Editors' Choice winner. Each of these sandals have sturdy contoured footbeds made with materials like EVA, PU, and leather that are difficult to bend in half down the middle. They do, however, bend in the forefoot, where the foot naturally curves. Next time you're at the store perusing flip-flops, pick a few up and try bending them in half. If it folds easily, it won't provide much, if any, stability. Contoured footbeds also provide more support. Manufacturers like OluKai, Chaco, Birkenstock, Astral Designs, and Vionic have all designed their products with footbeds that are anatomical molds of the bottom of a typical foot. Since we don't all have the same foot shape, it can be beneficial to try on different pairs of contoured flips to determine what is best for you. Some of the differences include heel cup shape, outer edge padding, and — most importantly — arch height. For example, the Vionic Tide II had the most intense arch support of all the models we tested because it has orthotics built into the footbed. This feature can be delightful for some people and excruciating for others, so trying before you buy is recommended. Almost always, contoured sandals are more expensive. Their designs are more advanced and intentional than the simple foam cut-outs of other models, and they use sturdier, more durable materials to provide exemplary stability and support. If you're investing in a contoured sandal, make sure that it supports the unique shape of your foot. Even though we can never expect a sandal to provide the support and stability of footwear like hiking boots, flip-flops with contoured footbeds, (especially those like the Birkenstock Gizeh that have vast amounts of invested thought and research), can come surprisingly close. Well designed contouring and wide straps meant the Gizeh was our top performer for support and stability. Speaking of hiking boots (we know, it's a weird topic for a flip-flop article…bear with us), let's drive home a point. If you love to hike on rugged trails, or often find yourself carrying a 50-pound pack on overnight backpacking trips, you need to purchase a supportive and stable hiking boot, right? We all know this will help keep your ankles from rolling, protect your toes from sharp rocks, and keep your joints healthy over the long-haul. But even if you're an avid hiker you likely aren't wearing your boots every day (outside of dedicated backpacking trips, of course). Now think about how many hours per week you wear your flip-flops throughout the summer months. If you're anything like our testers, it could be every single day for extended hours each day! Flip-Flops are not the right footwear for hiking miles of rugged trail or carrying a heavy pack, but even on mild terrain, it's still important to seek as much support and stability as you can, especially if you wear your open-toed footwear as much as we do. Sandals with contoured footbeds are supportive enough to wear all day without pain or injury and stable enough to handle rocky terrain. Sandals with contoured footbeds promote proper bone and joint alignment, keeping your feet and entire body healthier and happier. Thanks to their supportive footbeds, we comfortably wore models like the Gizeh and Ohana all day long without any discomfort. Likewise, we went on multi-mile hikes (over moderate terrain) in models like the Merrell Around Town and Astral Rosa. If you want a flip that you'll be able to wear all day — whether you're shopping beach-side boutiques or headed out on a mellow jungle trek — you should invest in a sandal with a contoured footbed. Finally, let's talk about fitting a pair of flip-flops properly. The first thing to remember is that this type of footwear tends only to be sold in whole sizes. Our main tester was a half size, so each review contains helpful information about whether sizing up or down is recommended. Typically, when consumers first put on a pair of thong-style sandals at the store, they forget that as we start to walk, out foot slides forward until the area between the first and second toe is fully pressing against the toe post. Although it may seem subtle, the amount that your toes slide forward can completely alter the fit of a flip-flop. It's important to start here because this is how the sandal will fit when you are walking. Too much slide or an uncomfortable toe post could leave you very unhappy later on (keep in mind, of course, that most toe posts will break in and become more comfortable with time). The placement of the toe post and the fit of the straps will both affect how far up your foot slides (i.e., looser straps will allow your foot to slide farther forward). Even though a specific model may seem like it fits the length of your foot while you're just standing, the fit may be slightly off once your toes slide up against that post. And, if any part of your foot is hanging off the sandal, steer clear and look for something that has tighter straps, adjustable straps, or a longer and broader toe box. Every flip-flop design will have slight differences in how the toe post feels, how wide and long the toe box is, and where the arch supports (if there are any) will fall. While we know shopping online is convenient and often more cost-effective, the more models you can try on in person the better your final fit will be. Once you've made sure that the toe post is well-placed and the straps fit the volume of your foot, tune into your arches. Make sure that you can feel some support under them, as this will help prevent conditions like plantar fasciitis. Different models have different arch heights, so choose one that feels natural under your foot. 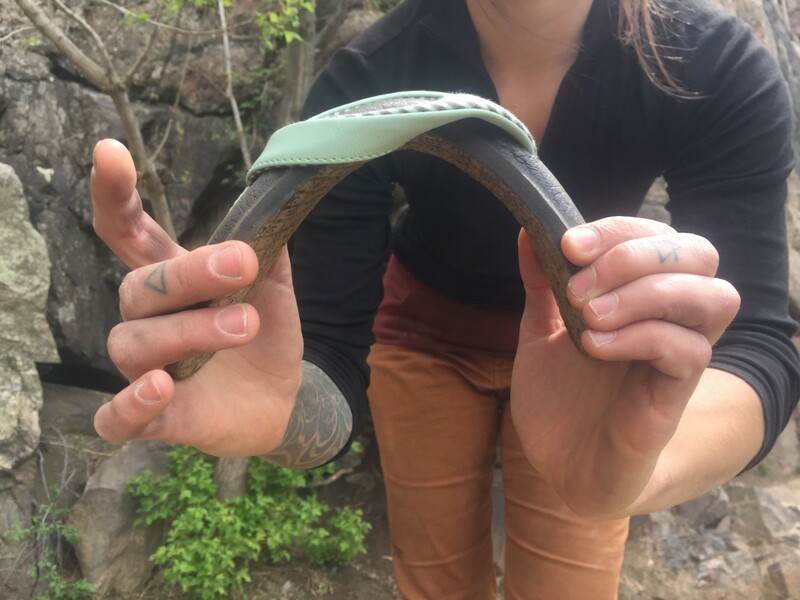 Some pieces like the Gizeh even have rounded heel cups that help keep the heel bone in place and provide extra stability. If this is the case with the model you're considering, be sure that your heel sits comfortably in the center of the cup. If you have broader feet, products like the Ohana have wider soles and toe boxes. The deep heel cup and strategic contouring of the Birkenstock footbed helps provide superior stability and support. Lastly, you'll want to think about strap fit. 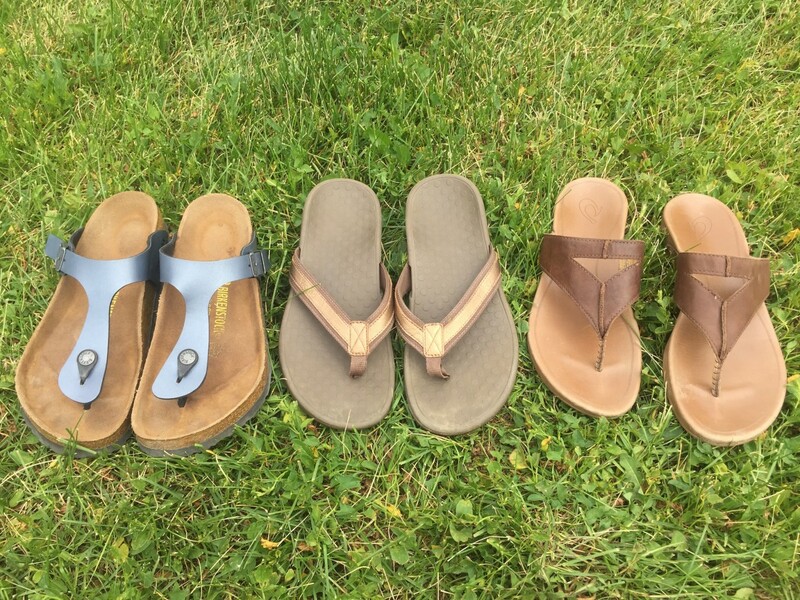 Different strap configurations not only affect the look and style of your sandal, but they are also an essential component of the overall fit. 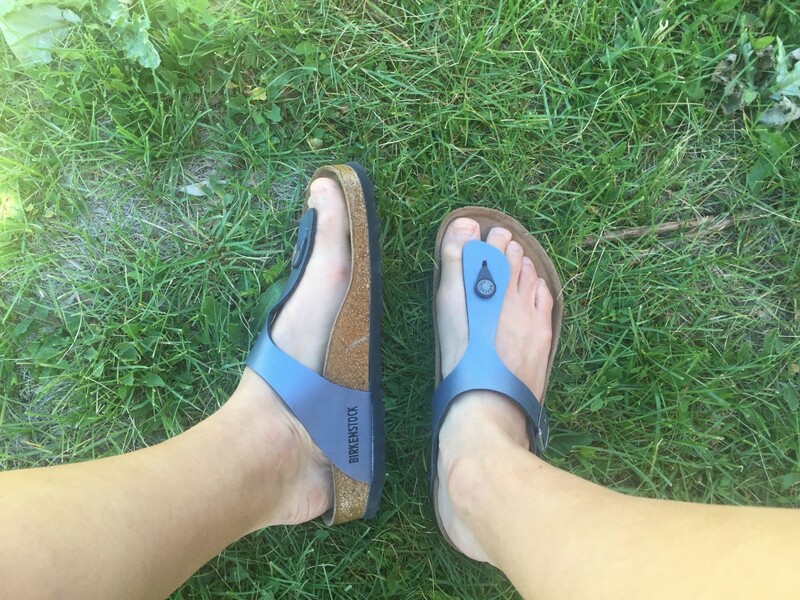 The classic V-shaped straps seen on models like the Rainbow Single Layer Premier or Chaco Flip can be sufficient, but very often they will be too loose or too tight depending on your foot. For casual jaunts around town this isn't a big deal, but for longer days and more intense activities, it can be a deal-breaker. Models like the Teva Olowahu have straps that crisscross over the top of the foot. These can provide a tighter fit for some, but they also run the risk of being uncomfortable or impractical for specific foot shapes. More stable and supportive models like the Birkenstock Gizeh, Astral Rosa, or Merrell Around Town have buckles on the straps for adjustments, allowing more people to be able to get a perfect fit. This is a massive bonus if you have low-volume feet and tend to have difficulty finding straps that feel secure. We realize that much of this is hard to assess if you're shopping online. For those of you that can't or don't want to try things on in person, our Test Result and Ratings table on the main page of this review provides measurements for each model. While this is only for the size we tested (size 9 for most), it can still offer some insight and illustrate differences between models. For each shoe, we measured the width of the straps, the length of the entire shoe, and the length of the toe box. If you have long toes that tend to sneak off the end of open-toed sandals or an in-between size that's hard to fit, these measurements might help you out. The take home point with all of this is that even minimal shoes like flip-flops have a lot of components to consider before purchasing — particularly if you plan to spend the majority of your time in them. Do your feet and body the favor of taking a little extra time to consider all of these features and your warm weather months will be even more enjoyable. Mountain meadows and flip-flops, two pieces of a summer well done.